This collection of spare short stories was really good, although not quite what I was expecting (although I’m not sure what exactly I was expecting if you ask me). Apart from being this surprise read, I really enjoyed Sillitoe’s early work and have ordered his debut novel (from 1958) called Saturday Nights, Sunday Mornings as it sounded so good. Sillitoe is usually considered to be one of the earliest members of the “Angry Young Men”* movement in England during the 1950’s which embodied the feeling of disillusionment stemming from the hardships of WWII that were still ongoing years later. Industry had not really recovered since the war, unemployment and poverty were rife (especially for the working class in the Northern part of England), and so conditions were tough for a lot of people. It’s from this perspective that the stories are shown – of working class lads living working class lives facing common life problems. 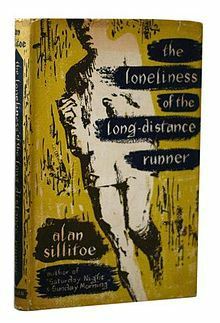 The title story, The Loneliness of the Long Distance Runner, is the one that I have heard of before although, for many years, I thought it was about marathon running (haha). It does concern running, but it’s much more literary-minded than that. It’s from the PoV of a young lad who has been sentenced to some time in Borstal, a youth detention center across the country (in England) usually set in barren and removed environments such as the moors etc. It’s a tough place and its inmates end up tough (if they’re not already), and for the protagonist of this particular tale, his is not a life he cares that much about. When he is selected from amongst his fellow inmates to run long-distance for the Borstal team, the act of running takes on much more meaning than his supervisors realize. In running, this boy has his freedom when he has none otherwise, and so at the end, when he asserts his choice, it’s a way of reclaiming his independence. It’s really an excellent read. When Sillitoe was actually writing these stories, Wikipedia has an interesting theory (true? I don’t know…) about how the Labour Party (political party) continued to want power distributed among the wealthy and elite more than the working class (perhaps in case of uprising), but it knew it needed to keep the lower classes happy. So the welfare state was created and strengthened without assigning much political power to its beneficiaries and the Angry Young Men movement was born. The Angry Young Men (who were sometimes called the Angries 🙂 ) were a group of mostly working and middle class playwrights and authors (including Kingsley Amis, Alan Sillitoe and Philip Larkin) who rose to fame during the 1950’s in the UK and were characterized by disillusionment with traditional English class-riddled society. As time went on, the Angry Young Men group became less unified and many of the authors who were classed as such dismissed the idea and were not happy with being bunched together. (Can’t blame them – it seems to me that they were such a varied lot that lumping them all in one group would have been nonsensical.) It’s really interesting to read about and there’s loads on-line about this if you’d like to travel further down the particular rabbit hole. This entry was posted in books, Fiction, TBR and tagged angry young men, British, England, Fiction, short story by lizipaulk. Bookmark the permalink. with unique thoughts on this subject matter. Seriously.. thank you for starting this up. I’m really inspired with your writing talents as well as with the layout for your blog. Is this a paid theme or did you modify it yourself? Anyway stay up the excellent quality writing, it is rare to peer a nice blog like this one today.. It is a wordpress theme. Thanks! Thanks! It’s good to hear that. Do you have any book reads to recommend?